The U.S. Patent and Trademark Office on Thursday published an Apple application for a method of generating car travel routes based on user preference and crowd-sourced real-time traffic data. 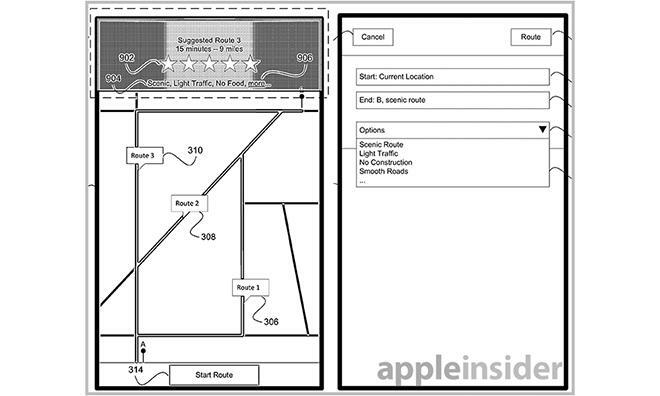 Much like the popular crowd-sourced navigation app Waze, which was recently acquired by Google, Apple's "User-specified route rating and alerts" patent filing generates custom routing information based on user input. As described, the system pertains to cellular-enabled mobile devices with built-in GPS components, like an iPhone or iPad. Unique to the application is a built-in system that allows users to assign a number rating to a route just traveled, which is then sent to a central navigation service that generates separate routes for other users based on the information. In order to operate efficiently, the system relies on a rating database that stores user ratings for both routes and specific locations, which can be pushed to other users' devices if so configured. Walking through an example process, the patent application notes users will start the navigation engine by selecting a route with start and end points. The system will generate an ideal route based on user preferences, filtering out unwanted configurations. For example, a user may want to take a "scenic" route, or one that has a minimum number of star ratings from other users. As a user drives, they can initiate alerts at any given point along their selected route. Along with positioning data, other information can be added, like approximate alert duration, type of alert, and whether an alert area should be avoided. If there are multiple entries for a given location, the central navigation service will aggregate them accordingly based on proximity. Once in the database, these alerts can be presented to other drivers when necessary, or when a device is within predefined threshold distance. For example, a poorly rated location or accident will only be displayed on a user's device if they are within five miles of the incident. When a user comes to the end of their specified route, the system presents a rating interface based on either numbers or stars. This information is used to generate new routes, or parts of routes, for other users. Illustration of end of route screen and rating graphic. The implementations described are very close to those already in use by crowd-sourced apps like Waze, which supports not only accident reporting, but current average speeds and social networking assets as well. 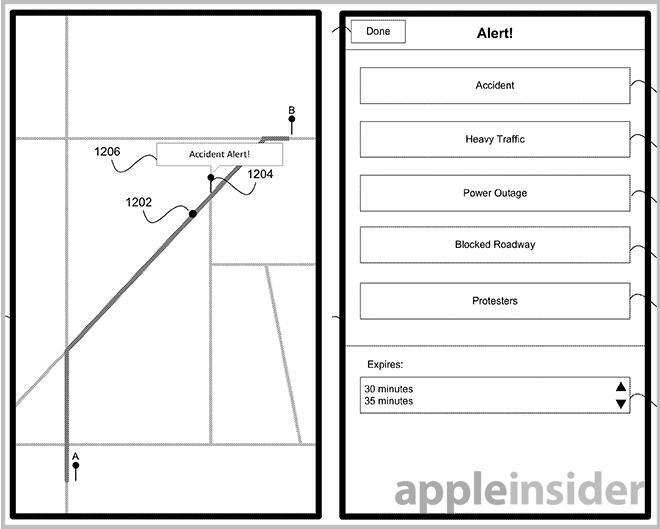 It is unclear if Apple will one day include the crowd-sourced alert and route rating system into its Maps app, though the number of iOS devices in use could make for a robust network if deployed correctly. 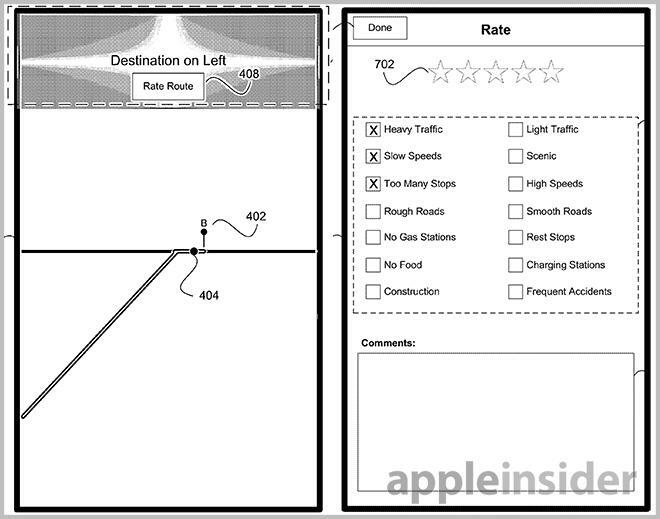 Apple's route rating patent application was first filed for in December 2011 and credits Jorge S. Fino as its inventor.